by MERKS: Day 284, outfit 284. Today, I'm wearing green and blue. 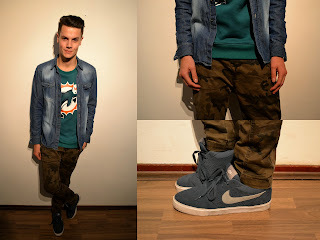 A army jeans, my Miami Dolphins sweatshirt and a denim shirt. The shoes for today are my blue Nike's. GOT A NEW HAIRCUT. I FINALLY FOUND AN AMAZING BARBERSHOP IN NIJMEGEN, CALLED The Barberstation.